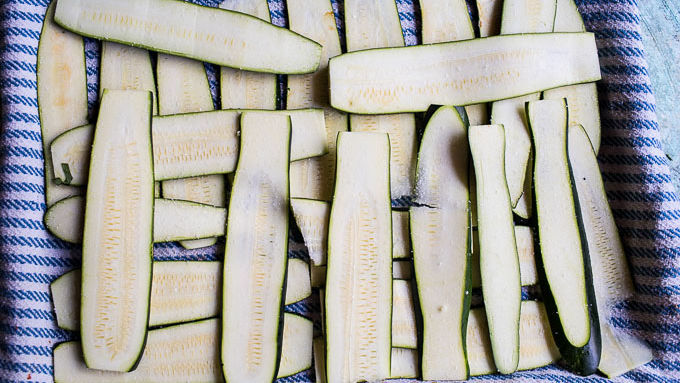 Slice zucchini into 1/8-inch thick slices using a knife or a mandolin. Sprinkle zucchini with salt and set aside for 10 minutes. (Salting zucchini takes out a lot of the extra moisture.) After 10 minutes, blot off excess moisture with a paper towel. Preheat the grill to high heat and grill the slices of zucchini until lightly charred on both sides. Again, use a paper towel to blot away any excess moisture. Heat a small saucepan over medium heat and add the butter. Once melted, add garlic and cook 30 seconds to 1 minute. Whisk in flour until no clumps remain and cook another minute. Slowly pour in milk, whisking to combine as you go. Stir in poultry seasoning and salt. Bring milk to a low boil and simmer until thickened, about 5 minutes. Stir in the Parmesan and cream cheese until melted, remove from heat. 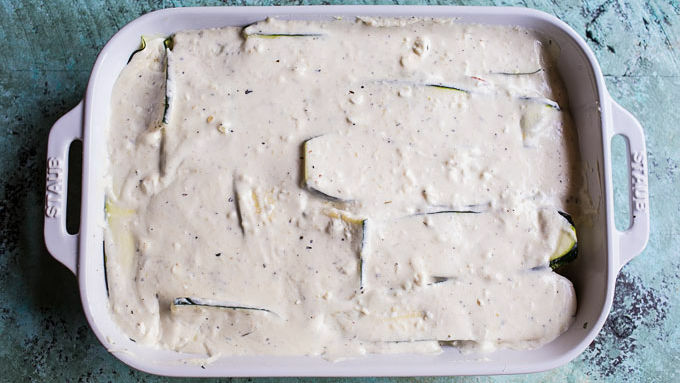 In a 9x13-inch casserole dish, spread some of the cheese sauce on bottom of dish and layer zucchini to cover. Next, spread a layer of chicken and broccoli and then top with gouda cheese. 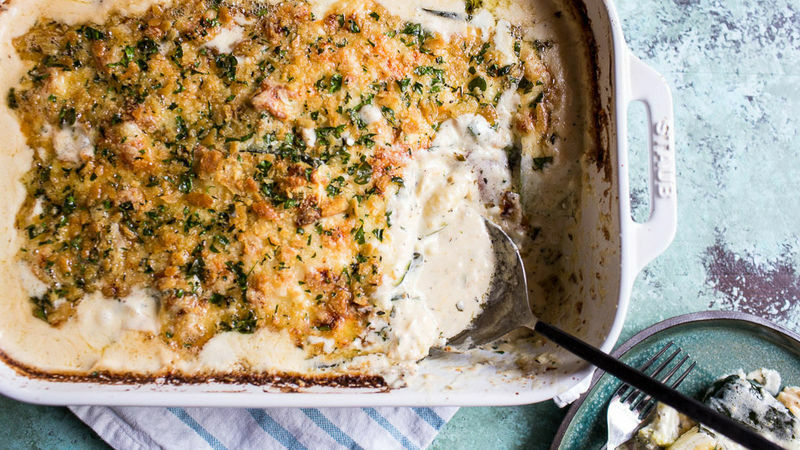 Repeat the layers until all of your ingredients are used up, making sure to top off with cheese sauce and gouda. Sprinkle with breadcrumbs and then cover with foil. Bake 45 minutes or until the sauce is bubbly and cheese has melted. Let stand about 10 minutes before serving. Top with fresh thyme or your favorite herbs. Feel free to use your favorite veggie combos and cheese here. I think a spinach and artichoke would be delicious! To make this a vegetarian lasagna, swap the shredded chicken for cooked beans or lentils. This cheesy chicken lasagna gets hefty texture and bold flavor from a Parmesan cheese béchamel sauce mixed with layers of zucchini "noodles". Can you say YUM or what? Typically, I’m all about the carbs. I mean, pasta is one of my favorite foods, and my mom? Well, she taught me that when in doubt, always add bread or pasta to a meal. Smart woman! So, why I am I telling you about a pasta-free lasagna?? 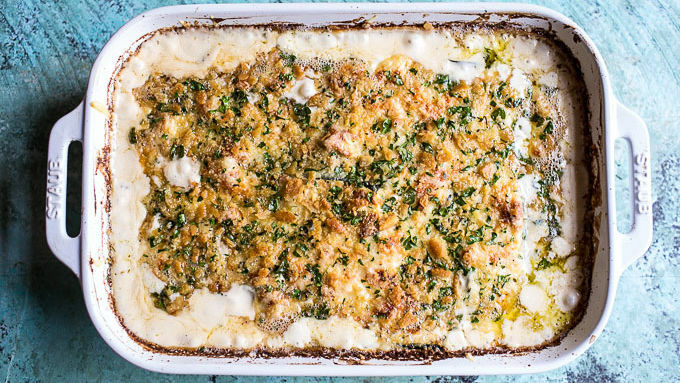 Because it’s an exceptionally delicious Chicken Parmesan Zucchini Lasagna… and it’s amazing. It’s also a KILLER way to use zucchini. Also, the cheese! The cheese supersedes the carbs, you don’t even miss the pasta. Plus, zucchini lasagna begs for a delicious loaf of crusty bread to go with it. 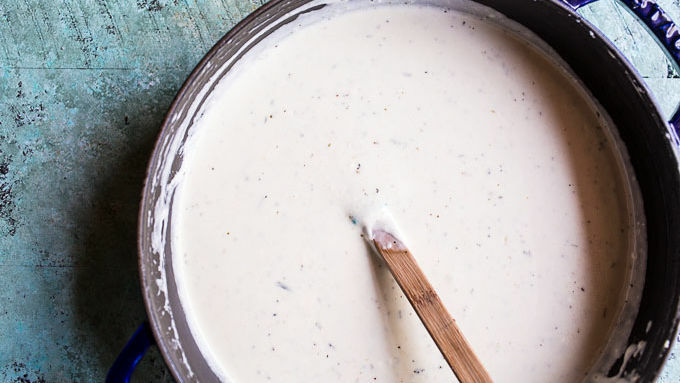 Perfect for dipping into that creamy béchamel sauce. Mmmm. Okay, but in all seriousness, I do love this recipe. Even my picky family didn’t notice the whole no pasta thing. The chicken and cheese combo had everyone asking for more. I could not have not been happier with the way this pretty (and slightly better-for-you) lasagna turned out. It’s a fairly simple recipe to prepare and is such a HUGE crowd pleaser. I definitely plan on serving it at upcoming family gatherings. It’s also the perfect dish for all your gluten-free friends. Your entertaining problems have been solved, a dish for almost everyone!